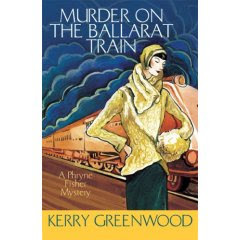 When the 1920's most glamorous lady detective, the Honourable Miss Phryne Fisher, arranges to go to Ballarat for the week, she eschews the excitement of her red Hispano-Suiza racing car for the sedate safety of the train. The last thing she expects is to have to use her trusty Beretta .32 to save lives. As the passengers sleep, they are poisoned with chloroform. Another fun read from the Phryne Fisher series, following on from Flying Too High. There's lot happening including an interlude with the delicious young university student Lindsay, the mysterious death of an older woman where there are not even any footprints found near the body to start tracking the killer, a young woman with amnesia and a very dodgy boarding house. Are they connected? I have to admit that reading this book did make me think really hard about train travel in the 1920's - something that I can assure you that I don't generally think about! The reason being these days it takes about 90 minutes to get to Ballarat from Melbourne on the train and yet in the book it appears as though it was an overnight trip in those days, and the other reason being that once the murder is discovered they end up in a little town called Ballan, and I live right near to Ballan Road...never been there, but there is something cool about reading a book that is set where you live! The cast of supporting characters is getting bigger and bigger, something that I would imagine will have to stop at some point in the series, given that there are currently 16 books in the series. Phryne is once again living her very decadent lifestyle to the fullest, and the sense of time and place is excellent! Looking forward to the next book! I only wish that the versions of the books that I am getting from the library had the same gorgeous covers on them like the ones above! Maybe as I get closer to the end of the series I will get the nicer covers. I have the first three books in this series--I really must get going on them. I love train travel by the way. It seems like in the 20s it was so elegant.